« Banana crumb (mini) muffins. These fries are easy to make and a healthy whole food snack. I tend to buy a bag of potatoes and eat some then end up wasting the rest (J loves to remind me of that every time I put a new bag in the shopping cart). I think it’s because potatoes seem to take f o r e v e r. Boil, mash, add butter and milk and fry up garlic or bake for 40 minutes to an hour, come on really? These probably take about as long but they just seem to take less time and involve less work to me. Chop and bake, dip and enjoy! I’ve made these about 4 times in the past couple weeks and have actually been using up all my potatoes now and no waste. 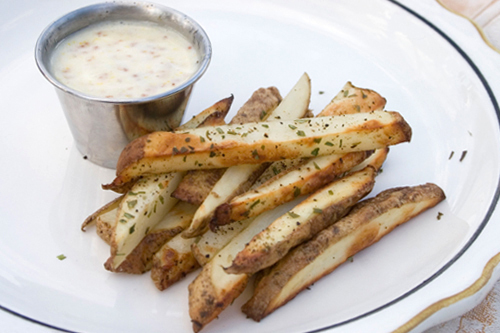 I’m going to try garlic butter fries one of these times (though honey mustard and fries will always be my #1). The possibilities here are endless. Experiment and have fun, salsa verde fries? Below is a picture of the kind of raised rack on cooking sheet I talk about in the recipe preparation. Preheat oven to 450 degrees. Wash and cut potatoes into fry shapes. Coat with a little olive oil, salt and pepper, and whatever else. Place a raised wire cooking rack on top of a cookie sheet. 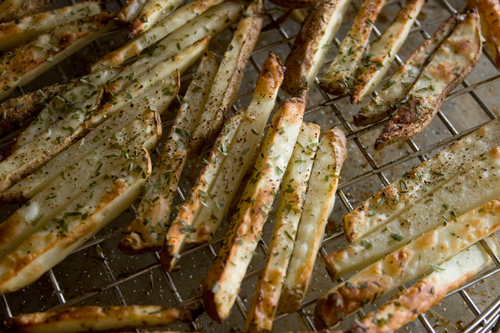 Spread fries evenly on cooking rack and bake for 30 minutes (start watching after 20 minutes). This entry was posted in American, Food, low calorie, vegetarian, Whole foods and tagged fries, fry, low calorie, potato, potatoes, snack, vegetarian, Whole foods. Bookmark the permalink. Both comments and trackbacks are currently closed.